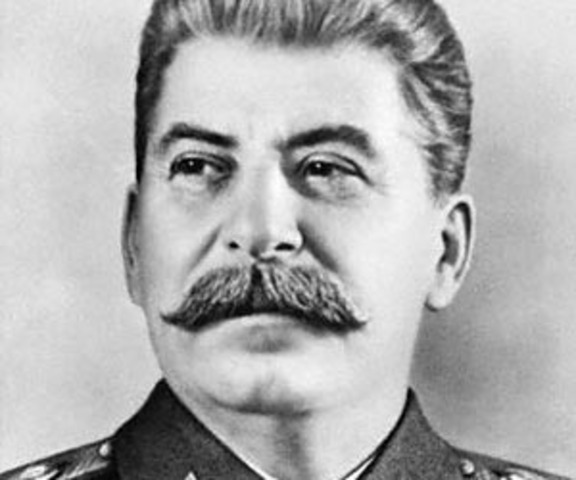 1929 - Joseph Stalin is made the sole dictator of the Soviet Union (USSR). He commanded the Soviet Union during this time as a dictatorship. Pictured: Portrait of Joseph Stalin. 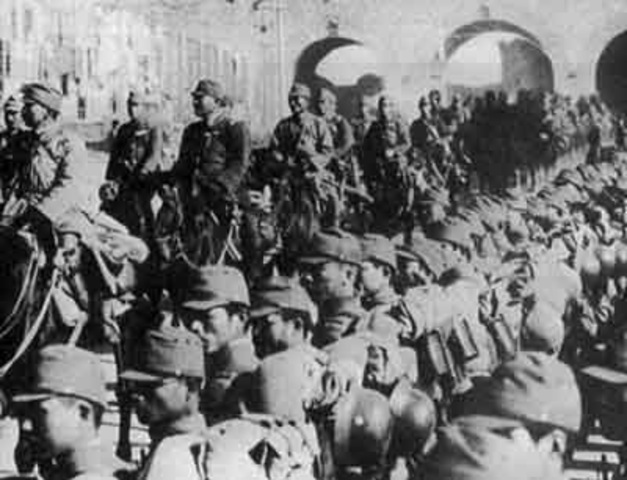 1931 - The Japanese army seizes the town of Manchuria, China. Under Japanese control, Manchuria was one of the most brutally run regions in the world. Pictured: Japanese soldiers storm into Manchuria. 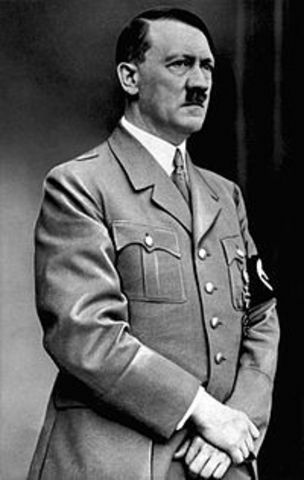 1933 - Adolf Hitler is named the Chancellor of Germany. Under Hitler, Germany soon would start World War II with the invasion of Poland and would start rounding up Jews for what we now know as the Holocaust. Pictured: Portrait of Adolf HItler. 1935 - The Neutrality Act, preventing the United States from aiding anyone in the war, is passed. 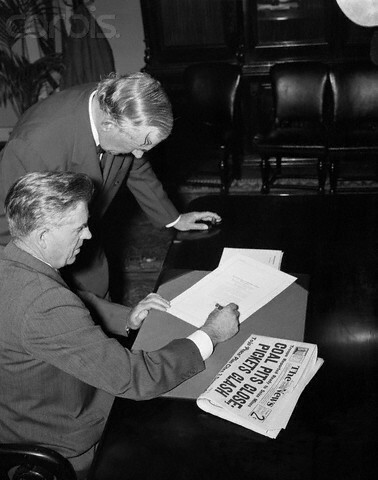 This is to ensure that no harm is done to the U.S. Pictured: Signing of the Neutrality Act. 1935 - The Italian army invades Ethiopia in Africa. Ethiopia's military was very outdated, so the Italian army won with ease. Pictured: The Italian army declares victory over Ethiopia. 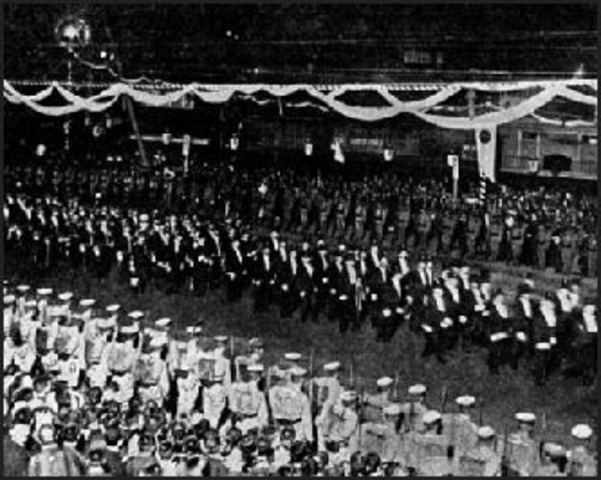 1936 - Militarists take control of the Japanese government. Japan became obsessed with militarism and the Japanese military grows and strengthen. Pictured: Vast militarism in Japan. 1936 - Adolf Hitler sends his troops into the Rhinelands. This was, for Germany, a violation of the Versailles Treaty. 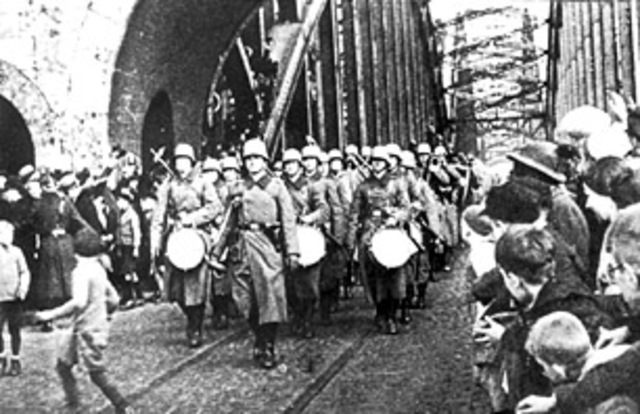 Pictured: German troops march into Rhineland. 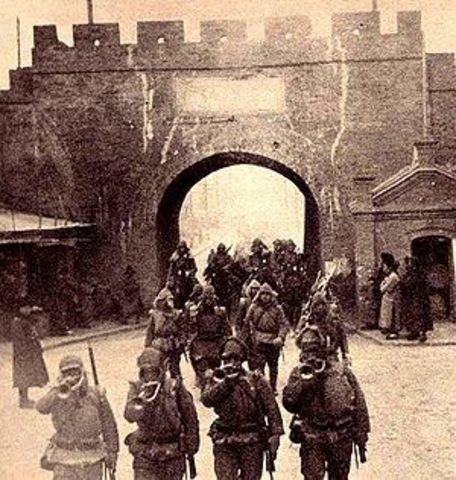 1937 - Japan's army attacks the town of Nanjing, China. They massacre a quarter of a million people. Pictured: Japanese soldiers storm into Nanjing. 1938 - The Munich Pact is signed by Adolf Hitler and the Prime Minister. This gave the Sudetenland of Czechoslovakia to Germany. 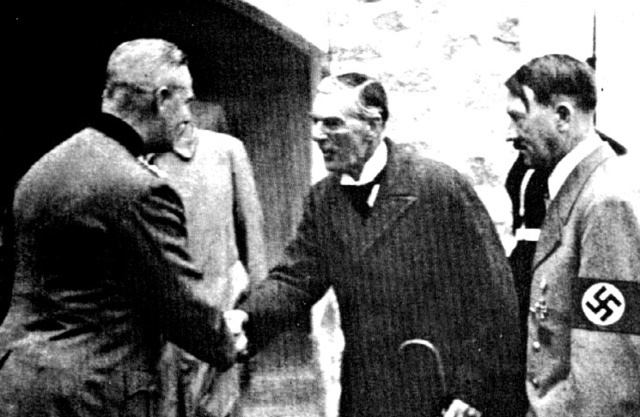 Pictured: The signing of the Munich Pact. 1938 - The Nazis begin to round of Jews for labor camps, which eventually turn into execution camps. This will be later known as the Holocaust. 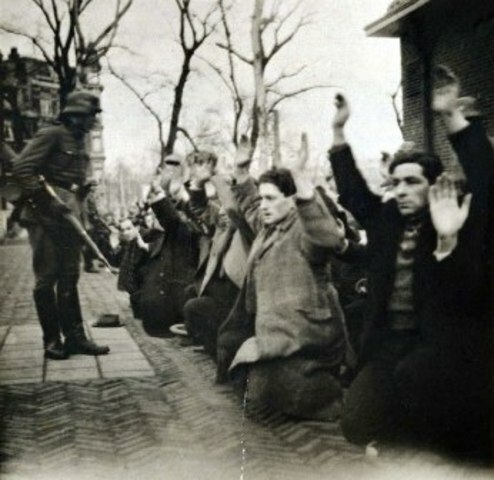 Pictured: Jews surrender to Nazi soldiers. 1939 - The Nazi-Soviet Pact is signed by Adolf Hitler and Joseph Stalin. This was a non-aggression agreement between Germany and the Soviet Union. 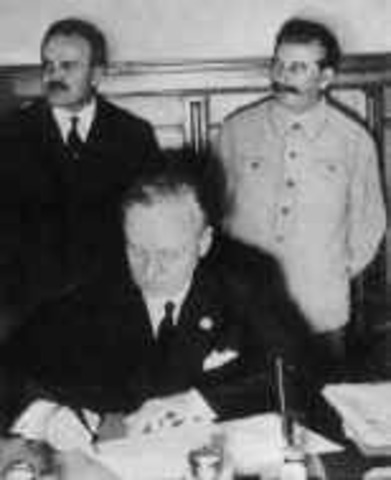 The signing of the Pact was suprising because Germany and the Soviet Union were bitter enemies. Pictured: Signing of the Nazi-Soviet Pact. 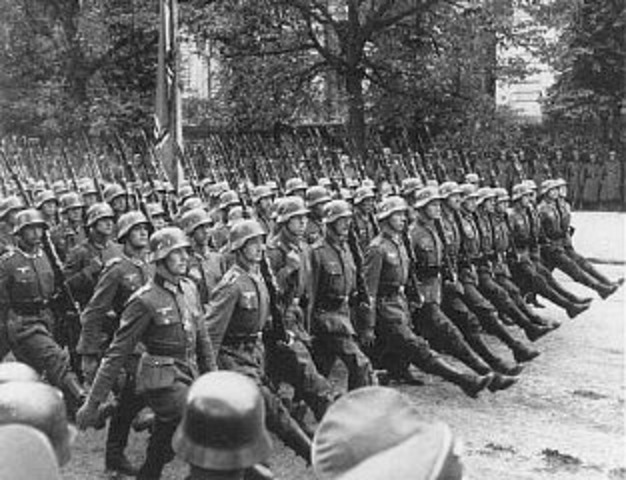 On September 1st, 1939, the Nazis invade Poland; In response to this, Britain and France declared war on Germany. This was the official start of World War Two. Pictured: Invasion of Poland by Nazi soldiers.